Astha Garg has done her bachelors and masters in commerce from Delhi University. She got a campus placement at Ernst & Young and worked there as an Assurance Associate for a year. She quit the job and did a certification course in french from Hansraj College. She then decided to go back to her hometown and work for startups. She joined a startup called Will & Skill Creation Pvt Ltd and worked as a Project Manager. 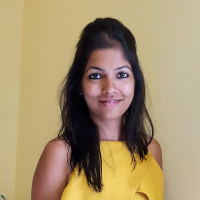 She then joined 4play (digital platform for adventure sports) in Manali as a Digital Marketing Associate. After working there for 8 months, she joined LifePage in 2017 as a content specialist and has been working there ever since. She is now a Content Manger with Lifepage. Content creation is the process of identifying a new topic you want to write about, deciding which form you want the content to take, formalizing your strategy, and then actually producing it. "I had a lot of experience in creating content for various startups." A Digital Marketing Associate may assist on every project, work on the planned strategy, the step wise work planned to be fulfilled by the strategies. An associate can also create plans for SEO, Adword text and banner ads, social media marketing posts and boost them through facebook ads, can create new blogs, new directory listings, increase backlinks by creating new platforms profiles of company on online media. "It was my friend's startup. Because I badly needed a job, I agreed to try my hands at digital marketing." An audit & assurance associate is responsible for the preparation of develop an understanding of the audit approach, methodology & tools and establish working relationships with client personnel.